Gardeners and property owners are always looking for the best way to kill weeds in lawns without killing the grass. There are various natural methods to kill weeds that won't affect the grass. Most natural weed killers act upon the cell structure of the plants and are useful for spot applications. Natural weed killers can remove this weed without affecting the grass. Acetic acids are able to change the chemistry at the cellular level of cell sap and roots. Damage to the weeds occurs rapidly and increases with higher temperatures. Acetic acids can kill weeds within 24 hours after initial application. Up to three applications may be required to have a lasting effect. Vinegar with a 20 percent acetic acid solution is an example. Fatty acids act as a drying agent. These acids dissolve membranes in the weeds and dehydrate the plant. Fatty acids and acetic acids affect weeds within the same time range. Fatty acids have a more permanent effect on areas where high use or prolonged use occurs. Salt is an example of a fatty acid used in weed control. The consequence of using fatty acids is the permanent nature of the agent; salt remains in the soil and does not evaporate, but can spread through runoff. Water-based weed killers are among the oldest natural weed killers. These include steam and boiling water, which kill weeds using rapid heat increases on the weeds. This burns the plant at the roots and leaves, thereby killing the plant. 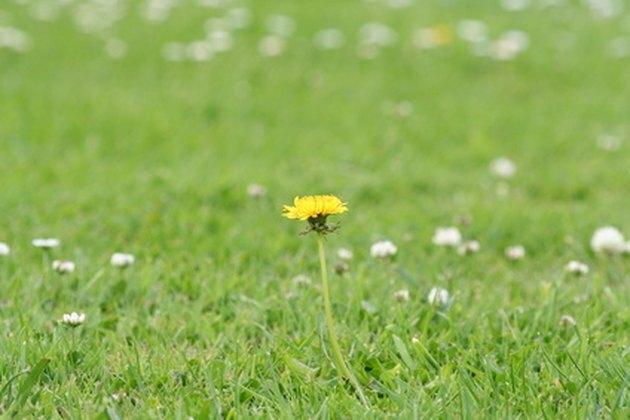 Weeds are damaged within 24 hours, although repeated applications are required to completely destroy weeds. These are herbicides especially formulated to kill broad leaf weeds without harming specific grasses. One such herbicide is Ortho, which comes in many formulations depending on the type of lawn. These are post-emergent herbicides used directly on weeds.